Is it too old-school Women’s Studies professor-y of me to point out that the eG8 — the “historic conference on the internet and the future of the digital ecosystem” that preceded the 37th annual G20/G8 summit in France — was a total sausage party? Of 109 speakers, 10 were women. Yep. That’s a whopping 9%. The gap between male and female use of the internet has narrowed to almost nothing in the last decade. Worldwide, 53% of internet users are male while 47% are female. But when we throw the big parties, the ones intended to introduce internet entrepreneurs to the leaders of nations to carefully-chosen representatives of civil society, the demographics (and thus the perspectives) are still fatally skewed. When the powerful try to set the democratic agenda for the information age, women are absent from the table. Seriously. Take a look at the speakers for the eG8 and tell me: Do you really want these guys defining democracy for the digital age? Is the eG8 what eDemocracy looks like? (If so, EGADS!) Or, is the eG8 an elite gathering just waiting for its own Seattle-inspired counter movement? What would a battle against the eG8 look like? 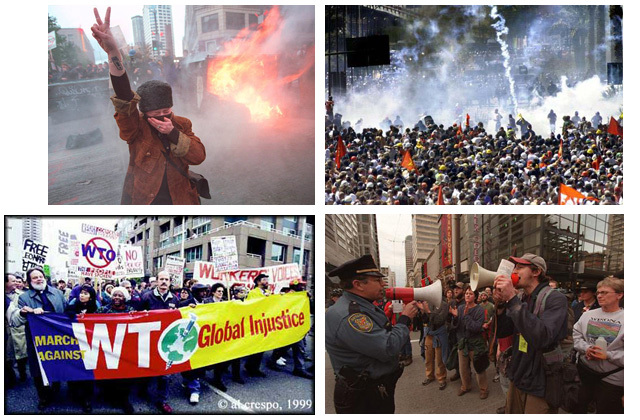 Images of the 1999 "Battle in Seattle" protests against the WTO. Credits, clockwise, starting from top left: Unknown, image found at http://omgthe90s.tumblr.com/; IndyMedia Ireland ; Al Crespo, University of Washington Digital Collections; Harley Soltes/The Seattle Times. Its goals will be bigger and better than net neutrality, freedom, and privacy, I hope. Those are such myopic and depressingly incomplete hopes for social justice in the information age. The protests would have to represent all the constituencies of the 1999 protests—national and international NGOs, environmental groups, labor unions, student groups, anarchists, religious groups—and then some. The institutions and long-term movements that grew out of the protests would have to be broadly inclusive, both demographically and procedurally. eG8 protesters like Cory Doctorow, Lawrence Lessig and La Quadrature du Net could inform this movement, but it would have to go far beyond their frameworks and agendas. …Protect the workers in the high-tech economy? …Make the rich and powerful “transparent” and “accountable,” not just pedestrians, welfare recipients and online consumers? …Respect and include all kinds of knowledge and experience, not just that of bureaucrats, engineers and CEOs? …Focus on using high-tech tools to protect human rights—including the rights to health, education, living wage jobs and basic social protections—as set out by the 1948 Universal Declaration of Human Rights? …Safeguard physical places—both environmentally and culturally—that provide us sanctuary and a sense of home in our increasingly disconnected world? Any fight for social justice in the information age is incomplete if it represents only the privileged few, if it stops at the boundary of our shared material world, or if it sees justice only as individual liberties. 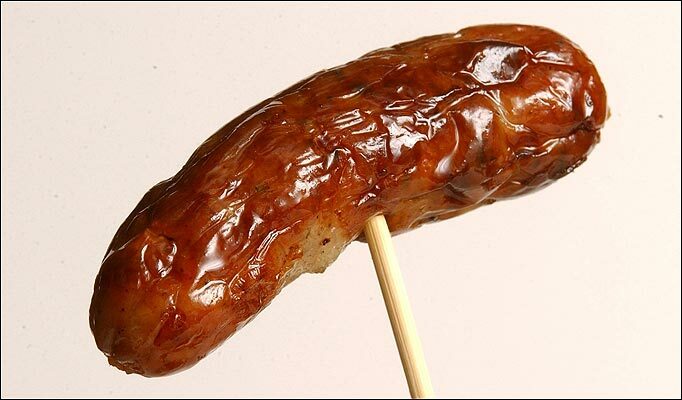 The eG8 is worse than a sausage party. It’s a self-congratulatory love fest between CEOs, government functionaries and a few token representatives of the “rest of us,” dressed up as revolution, freedom and radical democracy. The eG8 needs to be Seattle-d. Let’s get to work.